First London solo exhibition by Haroon Mirza. 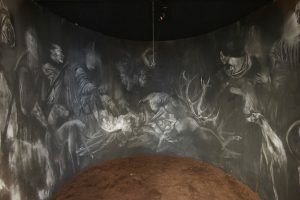 Working with video, sculpture, light and sound, Mirza creates large scale installations and assemblages that explore moments in social and cultural history and their points of intersection with aural traditions and music. Mirza’s works are simultaneously sculptural installations and audio compositions that alter the intended function of materials such as used furniture, household electronics, found or constructed video footage and sometimes artworks by other artists. The resulting assemblages give new function to and reveal the hidden qualities of outwardly disparate objects: an 80s hi-fi stand becomes a platform for a 90s computer monitor; mirrored coffee table is inversed to house a laser triggering soundtracks; a pair of domestic speakers become supports for a table top. Concerned with the distinctions that define noise, sound and music, Mirza investigates the possibility of the visual and acoustic as a unified aesthetic form and mode of perception. For Mirza, hearing and listening are as significant taxonomic markers as seeing and looking. 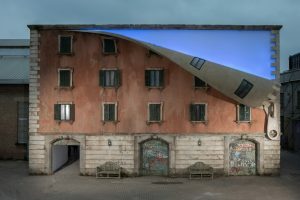 Consequently his work is informed as much by his experience as a DJ and the output of avant-garde composers as it is by the practice of other visual artists. 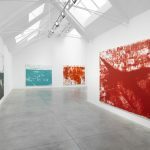 The works presented at Lisson Gallery explore a diverse range of subject matter from African drumming and ceremonial fighting to the work of minimalist sculptor Fred Sandback. Research into the latter saw Mirza delve into the Lisson archive where he uncovered correspondence and drawings from the 1970s in which Sandback describes how a particular work should be installed in the gallery. These inspired not just work in the exhibition – replications of Sandback’s installations in LED strips and speaker cables – but a shift by the artist towards an increasingly minimal approach to installation. 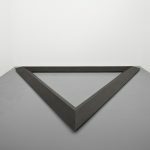 Mirza describes the works in the exhibition as “unfolding compositions in time” with each installation generating a seemingly cyclical and distinct field of sound often in the same tempo and key. the gallery. The viewer therefore experiences the individual works as autonomously active objects and yet the whole exhibition becomes a live group performance and unified installation. Free admission. Booking is essential. 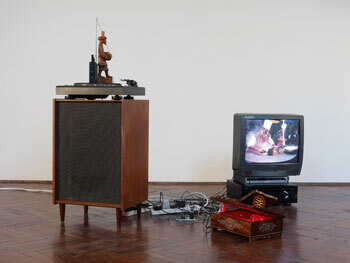 Haroon Mirza was the winner of the 2010 Northern Art Prize. He is shortlisted for the Arts Foundation Sculpture Award and is participating in the British Art Show 7. This entry was posted in EXHIBITIONS and tagged HAROON MIRZA, light and sound, Lisson Gallery, Sculpture, video. Bookmark the permalink.